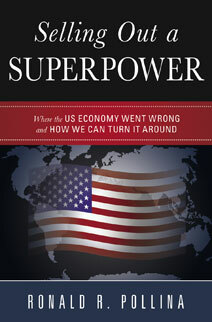 Competing in the Global Market: Is your state legislature helping or hurting your local efforts? What do Corporations Look For? How to Spend Advertising Dollars - If you have what it takes how do you flaunt it? 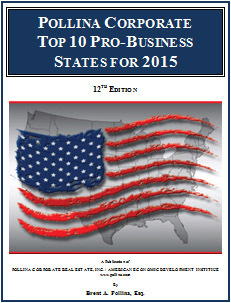 For nearly ten years the annul Pollina Corporate Top 10 Pro-Business States study has examined and ranked all 50 states. The ranking is based on over 30 factors, including taxes, human resources, right-to-work legislation, energy costs, infrastructure spending, workers compensation laws, state finical health, economic incentive programs and state economic development efforts. The study is the most comprehensive analysis of each states economic development efforts to create jobs and is often referred to by the press and economic development professional as the nations “Gold Standard” for such research. All factors are limited to those that are controlled by state government. The factors selected for examination by Pollina Corporate are based on over 30 years of experience helping companies select sites internationally. These factors are those that corporate executives place considerable weight on when selecting a location. Brent Pollina, Esq. can customize a presentation to show how your state has ranked over the years and compare your states performance to all other states or states in your region. In addition your states report card based on all factors can be shown providing a grade for each category as well as an overall grade for the last five years. How is your state performing when it comes to generating jobs and the resulting tax revenue that comes from a well employed work force?